Contributed by | Midwest Motion Products, Inc.
At Midwest Motion Products, Inc. we have built and shipped many tens of thousands of DC Gearmotors and Motors, since our inception in 2001. And, as one might expect, these motors and gearmotors have been applied in a huge variety of applications, from simple to complex, from occasional duty to continuous, in brushed configurations or brushless. The question is often asked, “how long can I expect this unit to last? Some important factors follow…. For the sake of the rest of this ‘discussion’ we’ll use the terms “Motor” and “Gearmotor” interchangeably, unless otherwise specified. Firstly, the relative duty is a significant factor. If the duty is continuous, that means the motor, if properly sized, will reach thermal equilibrium typically in about 20 Minutes of continual operation (possibly more, depending on the size of the unit). Once the unit has reached its rated temperature, at rated load, the brushes will continue to wear normally. For more information regarding Duty Cycles, please review the information available at THIS LINK. High armature speeds will cause more rapid wear, so, when possible, brush wear can be minimized by decreasing the armature speed, which decreases the friction of the brushes to the commutator. The trade-off, however, is the sacrifice of actual output power, so, in some cases, employing this “lower speed” tactic will create a larger sized unit than it otherwise might have been. But, if the larger size can be tolerated, then longer life can be attained. Just recently, MMP had a Customer report that they were able to achieve 8600 Hours of life from a brushed motor – and that was achieved due to the low armature speed, plus lower than normal current draw. In Geared Motors, the choice and optimization of the gear ratio is also critical. Current draw, then, is the second major contributor to brush wear. High levels of current draw, relative to the size of the unit and its rated continuous current, can and should be minimized when possible. Again, increasing the size of the unit is one method used to minimize current draw, as compared to the unit’s rated values. As is discussed on our “QUICK TIPS” page, found at THIS LINK, the measurement of actual full-load current draw is a must, in order to verify the proper sizing of a motor, and identify the required overload protection. Another important consideration is life-testing. If life-testing is to be done on an accelerated scale, you may wish to consider reviewing the information available at THIS LINK. The Operating Environment, especially high humidity and moisture can also influence brush wear. If moisture is allowed to enter the motor, it can mingle with any brush dust which may be present, and actually create a conductive paste, which in turn can cause arcing and sparking, and add to brush wear. This subject is also discussed in another paper we’ve published, found at THIS LINK on our website. In summary, protecting the motor from the ingress of contaminants and moisture, is often very helpful. This discussion will ignore the potential for ‘infant mortality’ of electronic components, in favor of focusing on Brushless Motor Technology. We must also assume, as stated above, that the Brushless Motor and its companion electronic drive, are sufficiently protected from external contaminants and moisture. Since there are no brushes to wear out, the next ‘’wear” item is the bearings. At MMP, our Motors employ only high grade “ABEC 7” ball bearings, designed to provide tens of thousands of hours of trouble-free operation. The ABEC scale is an industry accepted standard for the tolerances of a ball bearing. It was developed by the Annular Bearing Engineering Committee (ABEC) of the American Bearing Manufacturers Association (ABMA). The ABEC scale is designed to provide bearing manufacturers dimensional specifications that meet the standards of precision bearings in a specified class. Manufacturers who produce equipment that require bearings must also know the dimensional tolerances to design parts that will accommodate a bearing. There are five classes from largest to smallest tolerances: 1, 3, 5, 7, 9. The higher ABEC classes provide better precision, efficiency, and the possibility of greater speed capabilities, but do not necessarily allow the components to spin faster. The ABEC rating does not specify many critical factors, such as load handling capabilities, ball precision, materials, material Rockwell hardness, degree of ball and raceway polishing, noise, vibration, and lubricant. Due to these factors, an ABEC 3 classified bearing could perform better than an ABEC 7 bearing. Bearings not conforming to at least ABEC 1 cannot be classified as precision bearings as their tolerances are too loose. The scale also works as a guide for consumers to make informed decisions about the type of bearing they desire, despite not knowing factors related to materials, manufacturing, and performance. High rated bearings are intended for precision applications like aircraft instruments or surgical equipment. Lower graded bearings are intended for the vast majority of applications such as vehicles, mechanical hobbies, skates, skateboards, fishing reels and industrial machinery. High ABEC rated bearings allow optimal performance of critical applications requiring very high RPM and smooth operation. 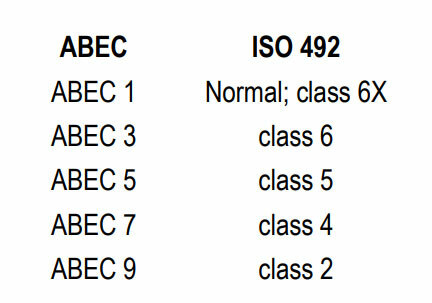 ISO's equivalent standard is ISO 492.